TEKVOX’s new Texas S.B. 507-compliant ViewVault fills the need for secure, cost-effective AV recording in classroom applications, according to the company. The easy-to-install drop-in solution requires very little set up or maintenance and is capable of recording and storing six months (1,667 hours) of HD video and associated audio. "ViewVault is an ideal solution for classrooms which need to comply with Texas S.B. 507," says TEKVOX CEO Jim Reinhart. "It has a very low start-up cost and no expensive infrastructure is required. Schools pay only for what is needed per classroom for a system that records and retains six months of audio and video based on a 12-hour day, five days per week. ViewVault is highly reliable, highly resilient, secure and economical." In the stand-alone, 'black-box' mode ViewVault requires no network connection. 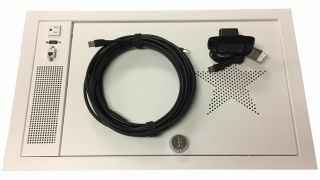 The system is configured prior to shipment and is placed discreetly in the ceiling tile grid with included camera, additional microphones as required and mounting accessories. Only a single electrical connection is required. ViewVault's powerful and flexible recording modes include individual weekly schedules, master schedules, record-on-motion, and hybrid modes that combine on-hours scheduled record with off-hours motion recording. This 'set and forget' system requires very little support and no drain on IT resources. In most cases, a ViewVault system in black-box mode can be bought and installed for under $3000 total cost with negligible ongoing costs - less that a 100W light bulb.